Global Travel Media » Blog Archive » Australia’s ‘big’ problem – what to do with our ageing super-sized statues? Australia’s ‘big’ problem – what to do with our ageing super-sized statues? Australians have been fascinated by “Big Things” since the 1960s, when statues such as Adelaide’s Big Scotsman and the Big Banana in Coffs Harbour were opened to great fanfare. These super-sized structures can be found in other countries, too. The United States is known for its Big Donut, Canada has the world’s largest fiddle, but the attachment to Big Things here has an almost patriotic quality. Many will recall childhood road trips punctuated by such highlights as a giant Merino sheep or a towering rocking horse, or an assortment of fruits – the Big Avocado, the Big Orange and the Big Mango. When the latter was reported “missing” in 2014, the news made national headlines, only to be later revealed as a publicity stunt. But in a nation now littered with at least 200 Big Things, there is a sizeable problem. What to do with them as they age and wear out? Many Big Things were built cheaply from concrete and fibreglass – materials that inevitably fade and decay. Some structures — such as the Big Pineapple, the Big Macadamia Nut, the Big Orange and the Big Prawn — have, in recent times, either fallen into disrepair or struggled to bring in much income. Then there are others, such as Cairns’s Big Captain Cook, which invite controversy. The Big Captain Cook stands in a vacant lot on the side of the Cook Highway; its legs show signs of concrete cancer and its paint job is flaky. The hotel that once accompanied Cook is long demolished, and the local community is divided over the appropriate fate of its landmark. Should he be repainted, or dismantled, or relocated to a place such as James Cook University where, in 2006, students petitioned for his adoption? (Since the university is named after Cook, they thought it would be a good match.) Earlier this year, he was draped with a large Sorry sign to coincide with Australia Day. Indigenous artist Munganbana Norman Miller has proposed the Cook statue be given a Big Boomerang to hold. 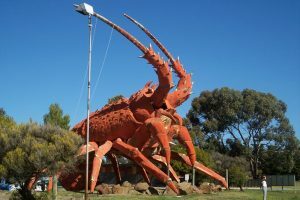 Then there is South Australia’s “Larry” the Lobster. Created in 1979, the 17-metre fibreglass crustacean has been on the market intermittently since the late 1980s and reportedly needed repairs. The state government offered A$10,000 to help in late 2015. The Lobster was recently the subject of a nationwide fundraising campaign #PinchAMate led by radio hosts Hamish and Andy. Earlier this month, Larry, who comes with a restaurant attached, failed to draw a bid at auction. But its owners said they were still hopeful of selling Larry, which recently had a A$50,000-plus makeover. Yet while some Big Things, such as the Big Orange (Berri, South Australia) and the Big Macadamia Nut (Nambour, Queensland), sit abandoned, communities continue to build new monuments to attract tourists to remote corners of Australia. 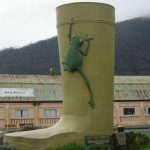 The Big Golden Gumboot in Tully, the Big Bogan in Nyngan and the Big Meat Ant in Augathella are examples of the new generation of local symbols. On the one hand, we can hardly begrudge a community that wishes to unite around a wonderfully kitschy piece of public art. On the other, we have to question why local authorities allow new structures to go ahead when these same local authorities may be asked to take on their upkeep in 30 years’ time. In 2009, the Big Pineapple was added to the Queensland State Heritage Register, giving it some legal protection. This move also imposed an expectation that the owners would maintain the structure for future generations. Some saw this as a victory, but for others — including the owners at the time — the listing was a burden that limited opportunities for commercial success. 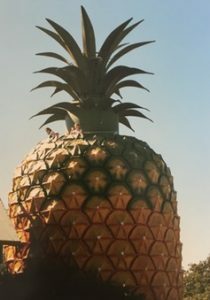 In 2017, the Big Pineapple is in the news again. A proposal for a multi-million-dollar overhaul is before the local council, with the aim of converting it into an “extreme tourism” attraction with adventure tourism, music, a water park, camping, a brewery and winery. This is clearly another attempt to bring life (and income) back to the ageing icon. ­One man’s trash is another man’s Big Pineapple. These are undeniably public landmarks of socio-cultural significance, and some — like the Pineapple — warrant preservation. Still, heritage bodies and governments will need to make difficult, and probably unpopular, decisions that may likely send some of our Big Things to the scrap heap. At the time they were built, it was already clear that Big Things typically have an expiration date. Disclosure statement: Amy Clarke does not work for, consult, own shares in or receive funding from any company or organisation that would benefit from this article, and has disclosed no relevant affiliations beyond the academic appointment above. The Big Prawn in Ballina was repaired and upgraded by Bunnings when they built there store on where the service station used to be. It is now a major icon on the way into Ballina from the Pacific Highway and looks terrific as it is now a complete prawn not part of a prawn when it was on top of the service centre. 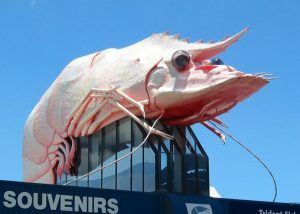 It now stands proud at the entry to the store and has become a major photo shoot for visitors to Ballina including selfies with the prawn in the background.